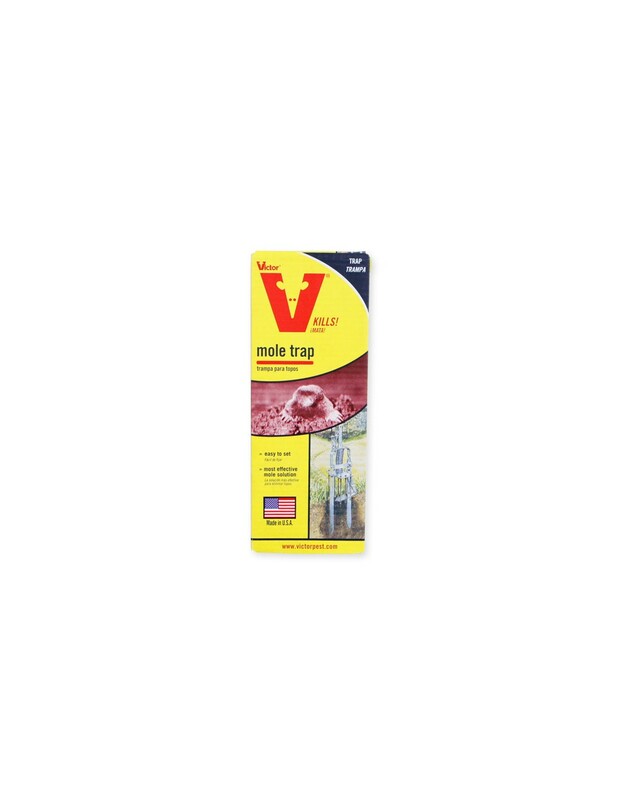 The Victor Mole Trap is the most effective device available for eliminating moles from lawns and gardens ! 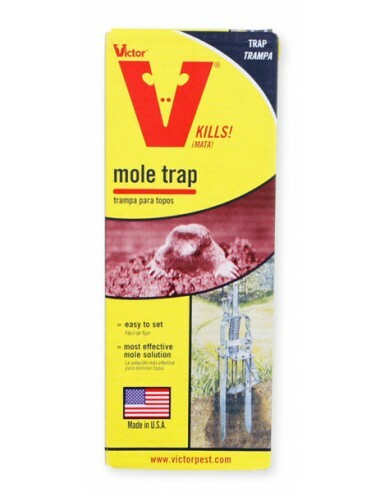 The Victor Mole Trap has No Poisons ! Trapping is best because newly made surface tunnels are easy to spot. Moles can be trapped during any season except in very cold or dry weather. See Moles under the pest information section for complete mole trapping information. Spring or Fall is the best time to trap moles because newly-made surface tunnels are easy to spot. Although moles can be trapped during any season except very cold or very dry weather. 1. To identify active mole tunnels, gently flatten out a portion of the tunnel. Wait 24 hours. Tunnels that resurface are most likely "active tunnels." Set traps in these locations. 2. Make a depression in the room of each tunnel by pressing down with your thumb. Center the trap on the tunnel, with the trap pan directly over the depression you've made with your thumb. 3. Push trap down until spears have "bottomed out." 4. Preset spear holes by plunging spears up and down until they travel easily to the bottom on their own. 5. Before setting the trap, make sure the firing latch is "OUTSIDE" the pan. 6. Holding the trap frame in place, rapidly pull upward on "T" handle until the firing latch snaps over the pan. Ease "T" handle down until latch catches. 7. Trap is set. If necessary apply slight downward force to ensure pan is fitting IN the thumb depression and is contacting the roof of the tunnel. 8. Trap has fired. Remove mole if desired. For information on setting in very hard or very soft soil, see box for details.